Dining room tables are the centerpiece for every great holiday and family celebration. Without a table, we often find ourselves staring at the TV without making memories or talking about our days. So why do that when you can find the perfect dining room table to bring your family together? We’ve researched and reviewed a variety of modern dining room tables so you can pick the very best one for your get togethers. All you have to do is take a seat and wait as we serve the best ones to you! There are a handful of things to consider before you buy a dining room table for your space. We came across a few characteristics that you might find of interest before pulling out your wallet. Here are a few things we think you should look for when looking for your new table! Material: What your dining room table is made out of will be one of the first things you look for. Depending on your space and decor, you’ll look for a material that fits right in. You’ll also want to make sure that the material is sturdy enough for multiple people to sit and eat comfortably. Size: Not every dining room will be perfect for a large dining table, so size does matter. Be sure to measure your space to determine if these dining room tables will fit. Always look for the size of the table before you get your hopes up! Chairs: If you’re in luck, you might find that the dining table you choose comes with matching chairs. 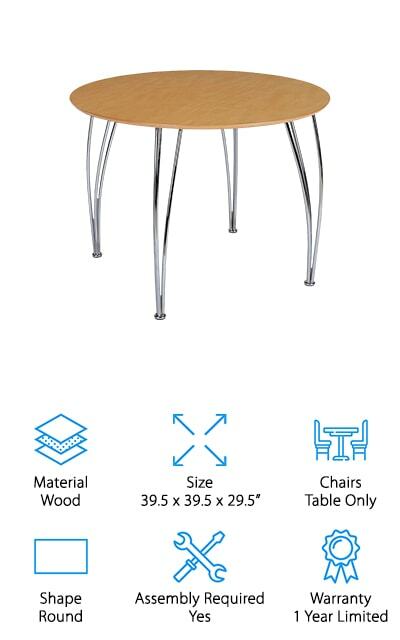 You might find that your table isn’t big enough depending on how many chairs they send home with you, so use the chairs as a guide for size. Shape: You may already have a preference for what shape of dining table you’d like, but there are a handful of shapes out there that might change your mind. Oval and square tables are the most common, but you might find that you like a different style better. Assembly Required: Oftentimes, furniture that you buy online requires assembly. If you don’t have time or want some assistance assembling your new table, you should look to see if the table you choose has an assembly option! Warranty: Furniture is a big investment that you’d hate to waste. Depending on what table you choose, the warranty may cover the entire table or just individual pieces. Check to see if your new table is covered by a warranty in case your box is missing a piece needed to assemble it. Drum roll, please! Now that you know exactly what to look for you can finally get ready to buy your own dining table. We’ve assembled our Top 10 list, with one top pick and one budget pick to summarize our very favorite options. But if you’re looking for something specific, be sure to check out the rest of our list in case you miss the perfect table! The Modway Lippa Dining Table is our top pick as it fits up to six chairs comfortably. 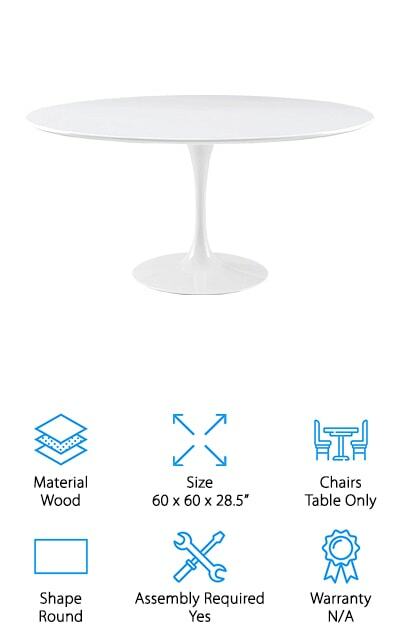 This round dining table comes in seven colors, including all white and wood finishes. 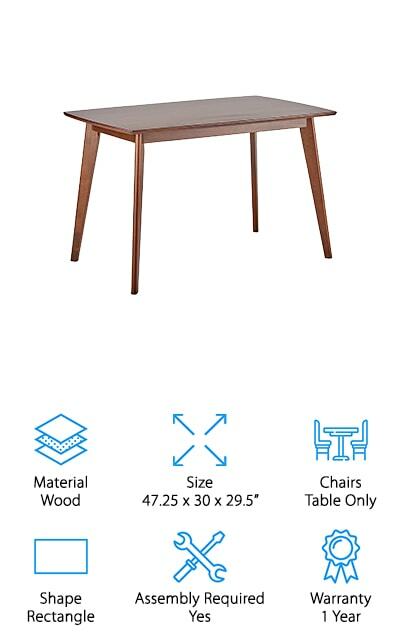 With 60 inches of tabletop, you’ll have plenty of space to entertain guests with this retro and vintage style table. This setup does not come with dining room chairs, but you’ll find matching chairs in the Lippa style to purchase separately. The finish on top of your table is chip-resistant, so don’t worry too much about injuring your new investment if you bump it on the wall or the doorframe. You’ll find that the aluminum base is also durable, yet lighter than your standard metal dining table. Assembly is required, but you have the option to have an expert assemble it for you if you run out of time. We love this modern style dining table from Modway because it’s big enough for almost any family and gives your home a great look, too! The Coavas Dining Table is our budget pick, but it doesn’t lack any of the essentials. Made with beech wood legs and a 5 layer varnish, this table is as durable as they come. The varnish prevents any warping from heat up to 200 degrees Fahrenheit. The tabletop is made out of anti-corrosion material, making it easy to clean and hard to injure. The four feet of the table come with foot pads to prevent scratching and loud noises when moving the table from place to place. Known as the table for people living in the city looking to add a piece of home to their place, the Coavas Dining Table is big enough for four people and small enough to fit into an apartment space. You can find matching chairs to buy separately, too. If you’re living in a small space and are looking for a place to eat, celebrate, and come together this table is the perfect size for you! If you are gung-ho about finding a dining table, then the DHP Fusion Dining Table is for you. 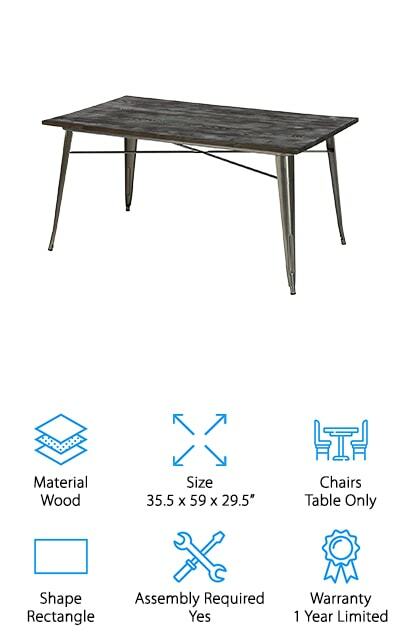 This table comes in a gun metal and wood style. Heavy legs give you stability, but the wood tabletop gives you a vintage and modern design. 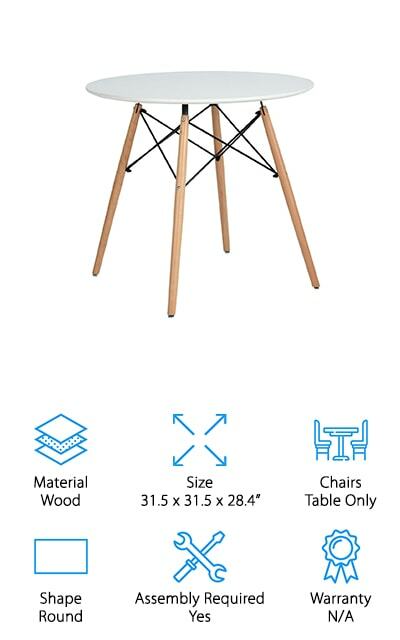 Chairs are not included in this purchase, but if you choose to buy matching chairs you can buy three styles of matching chairs including traditional chairs and stools. 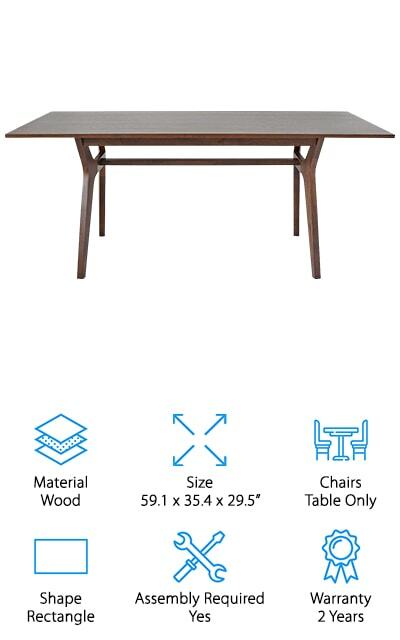 Assembly is required to set up this table, but you also have the option to have your table assembled for you by experts. Be sure to check that option at check out if you want it! The table itself fits four people comfortably and six people if you’re looking to squeeze in a few extras for a dinner party. No matter your style, this gun metal and wood dining table fits into any contemporary or modern dining room. Country kitchen or modern loft, the DHP Fusion Dining Table is a great pick! This dining room table comes from one of the furniture bigwigs, Ashley Furniture! Known for their quality and durability, this dining table is big enough for four people comfortably. The tabletop is a mixture of woods, giving you a unique look that other dining tables won’t have. The legs are made out of metal to give you strength and confidence that this table will last for years to come. Dining room chairs are not sold with this table, but you can buy matching chairs separately in sets of two. 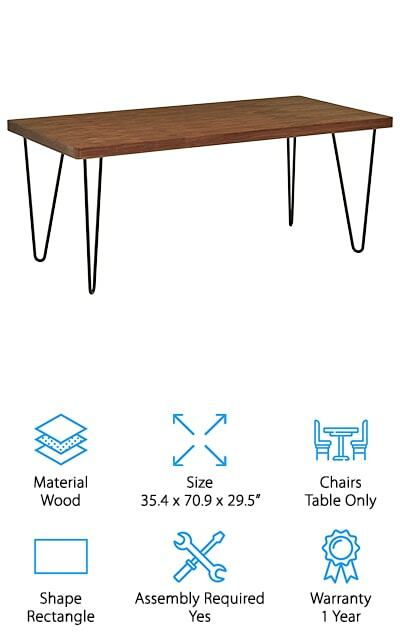 You have to assemble this table as it comes in pieces upon arrival, but if you’re interested in expert assembly you have that option at checkout. The instructions are said to be easy and simple to understand if that helps you decide! If you are looking for a classic, round dining table Ashley Furniture doesn’t disappoint with their two-tone wood tabletop. The Coaster Home Dining Table is exactly what you think of when you think of a traditional dining table. It’s made from Asian hardwood, chestnut to be exact, and MDF giving you the longevity and durability you want from a table you use for family gatherings. The table seats four people comfortably, with one on each side and one on each end. Chairs are sold separately in sets of two. It’s a perfect medium sized table for those with smaller dining rooms or open planned kitchens. With angled legs, you’ll really see the modern style in this dining table. Since the table is made with great materials, you can expect nothing less than a solid table that matches exactly what you see in the photo. Assembly is required, but you always have the option to have someone assemble it for you if you’d like. The Coaster Home Dining Table is a great option if you miss the traditional feel of a dining table and want a smaller version of your own! The FurnitureR Modern Dining Set gives you both table and chairs for your space. This set comes with one rectangular table and four chairs. This minimalist style table is great for any space as it slips in naturally, no matter the decor. Assembling your table is easy as it comes with instructions. The legs of the table and chairs are made of wood and come with brackets to add strength. The tabletop is made out of plastic to make cleaning easy. This set can be used anywhere from home to office, to give you a place to take a breath and come together. No matter if the size of your space is small, you’ll be able to find a space for this set to work. 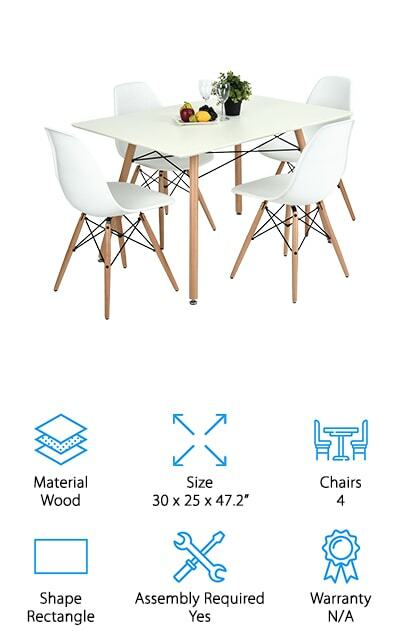 If you want to purchase one dining room set and be done, the FurnitureR Modern Dining Set comes with everything you need to get all of your friends or family members together in one place. The Rivet Hairpin Dining Table is the picture perfect modern dining table. Made with a wooden tabletop, you can imagine how this table will fit perfectly into any room. The hairpin legs are made out of black metal, giving strength to the table and also making the table appear as if it’s floating in midair. This table can be used as a dining table or desk, depending on what you choose to use it for. You can squeeze up to six people at the table if necessary, but it’s meant to fit four people comfortably. Assembly is required, but you can easily set it up in 15-30 minutes or have a professional assemble it for you once it’s delivered. If you decide you don’t like the table, you can send it back within 30 days. Any issues with parts or pieces for the first year are also covered under the 1 year warranty. The Rivet Hairpin Dining Table is a great addition to any dining room or office! 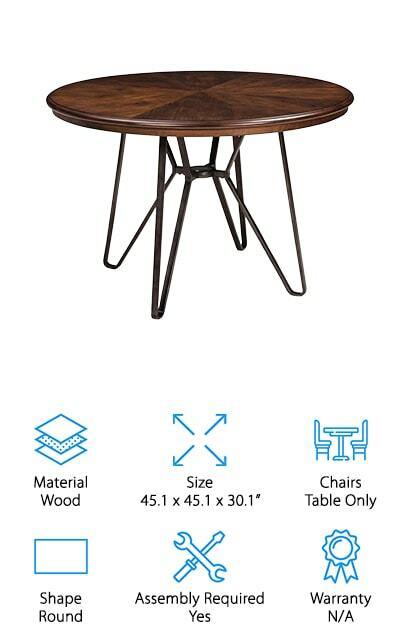 The Novogratz dining table is another great option if you’re looking for a round style table. Made from both wood and chrome you have a few choices if you’re looking to purchase this particular table. You’ll find that this table comes in colors like black, white, espresso, and grey. All tables come with metal legs to give your table the structure it needs. This table is perfect for smaller spaces as it fits two to four people comfortably. You can expect your table to come in two boxes, so don’t be alarmed if you don’t have all the parts and pieces in one place. Chairs are not included in this purchase, but there are matching sets available if you’re interested. Assembly is required, but you have the option to have someone set it up for you before your purchase. The Novogratz Round Dining Table is a great addition to any space if you’re looking for a modern or contemporary look. The Edloe Finch AUBREY Dining Table is another take on the classic wooden dining table. It’s made from Malaysian Oak and Walnut Wood Veneer, giving your dining room or kitchen a modern and contemporary vibe. This table has plenty of legroom for 4 people comfortably, and 6 people if you need to squeeze in a few extra family members. Parents are thrilled by this table as it holds ups to the test of kids and their spills. And it’s easy to wipe down, too. Although this table is rectangular, you’ll find that the corners are rounded so you can avoid hurting yourself if you ever run into it during the night. You’ll need to assemble this table, but it can easily be done in under 10 minutes as there are only a few parts and pieces to secure together. If you have any issues with damaged goods or missing pieces, this table comes with a 2 year warranty. If you want a traditional dining room table with a rounded touch, look for Edloe Finch AUBREY Dining Table! Our last pick is a glass dining table! The Uptown Club’s Linus Dining Table will definitely make a statement in any dining room with its stunning steel legs and glass tabletop. The table itself weighs about 75 pounds, so assembling this table will require two people at the very least. 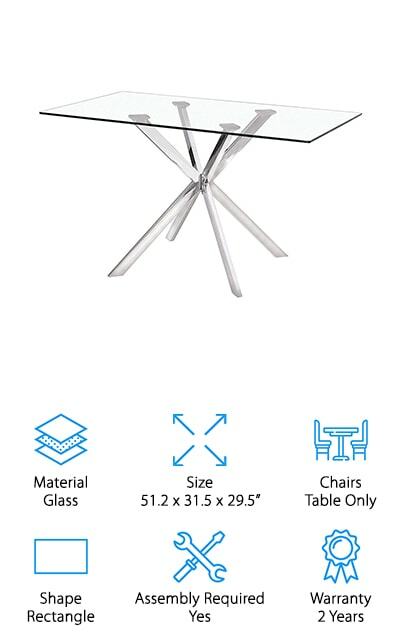 The criss-cross legs are made out of stainless steel to support the weight of the tempered glass top. Perfect for any dinner party or get together, this table fits 4 people comfortably. If you’re looking for a table for a big space, this table may not work well but if your family is small you’ll experience many great dinners together there. This particular table is much different than any of the other tables we’ve shown you, but it’s one that will leave all of your guests in awe. If you have been dying to have a glass table, you should check out the Uptown Club Linus Dining Table and add it to your shopping list!